Check out this great offer over at Britannia Hotels where you can enjoy an overnight stay with entry into West Midlands Safari Park and Big Tasty Breakfast from just £44.50 each!! This offer is available on various dates which you can check out HERE. Calling all animal lovers, it’s time to unleash your wild side with our West Midland Safari Park Break. Packages include overnight accommodation at our Bromsgrove Hotel & Spa, where you will receive a full English breakfast and tickets for the West Midland Safari Park. 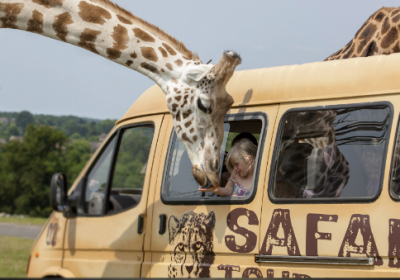 With animals such as zebras, water buffalos, cheetahs, lions, penguins, meerkats, elephants and even goats, there really is something for everyone at West Midland Safari Park. Not only does the park have a load of fantastic animals to see, you and your family can visit The Giggly Park for Kids, The Sega Prize Zone and The Land of The Living Dinosaurs, where dinosaurs come back to life. In a fun family way, not a Jurassic Park way. For an extra cost, you can also visit their Adventure Theme Park. This offer is only available for Thursday – Sunday stays. Whilst you’re visiting our hotel, why not make the most of it with a trip to our health club where you can enjoy some treatments, or take the kids swimming! You can also chill out in the Court Bar, or grab a coffee in the Java Coffee Lounge. If you’re feeling fancy, we offer delicious afternoon tea that you and the whole family can enjoy! We are only based around a 30-minute drive from the Safari Park which opens at 9am, so make sure you’ve eaten your Britannia Breakfast and are on the road by 8:30am to avoid the queues and make the most of your family day out!.